For simplification purposes I call the first flag civil, second government, and the third military flag. But their uses are interwoven. According to W. Smith [smi75a], the civil flag is used for civil and governmental purposes on land, the governmental flag is used by the government on land and sea, by civilians on sea and by the army on land. The military flag is used by the government on land and the military forces on land and sea. 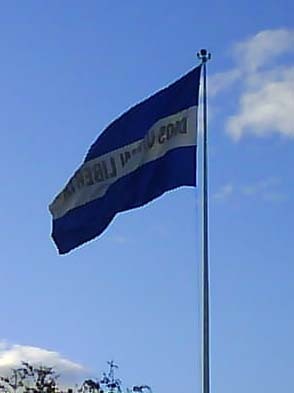 The blue-white-blue flag was for the last time confirmed on 27th of September, 1972. There is a long explanation of the flag (including biographies of poets who wrote poems on the flag) at: www.asamblea.gob.sv. Flag - The flag page starts describing the flag and its origins. It quotes its dimensions as 3,35 m x 1,89 m, each stripe being 0,63 m wide, "or any other dimensions as long as the flag keeps the same stripes and colours". It says it was adopted by Decree of the Legislative Power (aka Congress and/or Senate) on May 17th 1912. It is the same flag as that of the Central American Federation, decreed by its National Constituent Assembly 21st August 1823, whose colours were chosen by Manuel José Arce when he was named chief of the Salvadorian (sp?) militia which fought against Mexico 1822, remembering the colours of the Argentine generals San Martín and Belgrano. Arce told the idea to his wife Felipa Aranzamendi and his sister-in-law Antonia Manuela [Aranzamendi? ], and they both made the Flag of El Salvador Province in white and sky blue silk. The page then describes in detail how the national flag was first raised in 1912. Later it says that merchant ships shall not bear the Coat of Arms but the words "DIOS UNION LIBERTAD" (God Union Freedom) in silver lettering, and military units the Coat of Arms plus those same words on the top stripe and the branch of service and unit number on the bottom stripe (gold lettering for infantry and artillery, silver for cavalry). The Government may authorise private companies, city councils or official entities to place a special motto on the flag, as long as it always bears the previously mentioned one as well. Unauthorised use of the flag will be sanctioned with a 50 colones fine. It is compulsory to fly the flag on public buildings on national holidays and on the anniversary of friendly nations, together with the relevant nation's flag. It is also compulsory for both civilians and soldiers to salute the flag. On national mourning dates, the flag is flown at half staff with a black crape on the top. The page mentions poets who have composed poems and songs about the flag of El Salvador: Carlos Bustamante, Armando Rodríguez Portillo, Joaquín Zaldívar, José Leiva, José Luis Barrientos and Carlos A. Imendía. even though by 1912 the number of stars on the red canton had grown from 9 to 14 (standing for the 14 departments of the Republic). The 1865 flag had 9 stars for the initial nine departments (from the oldest to the most recent): San Salvador, Sonsonate, San Vicente, San Miguel, La Paz, Santa Ana, Chalatenango, La Libertad y Cuscatlán. Five departments were later added (though I do not recall that El Salvador had any territorial gains in that period). It ends up describing how the 1865 flag was approved and first raised, and how the BWB flag had been previously in use (apart from 1822) by the Republic of Honduras, El Salvador and Nicaragua (created by the Leon Pact 1849) from 1851 to 1865 and by the Greater Central American Republic ("República Mayor de Centro América"), which included the same three countries (created by the Amapala Pact 1895) from 1895 to 1898. So there are 3 designs one can use as state flag (say on government buildings), and 2 designs can be used by army. Flag with coat of arms: CS?/?S? The question marks because the law says nothing about military installations that would distinguish them from other public buildings and nothing about maritime use that clarifies which design of the three is used in which cases. I assume Album 2000 is reliable on this front. - National Flag and Naval Ensign (-SW/--W 189:335) - Blue-white-blue triband with the national coat of arms in the middle of the white stripe. The coat of arms I used is by Graham Bartram though at this size it is probably not that important. I noted that the modern representation (both Graham and Armand) do not include the five-pointed star at the base of the circular inscription, that is found in older images, like Flaggenbuch and National Geographic 1917. - Civil Ensign and Alternative State Flag (-CW/CS- 3:5) - Blue-white-blue triband with yellow inscription DIOS UNION LIBERTAD along the white stripe. The yellow (gold) inscription is relatively new practice (in the case of Salvador that means post-WWII). Previously variations with silver inscriptions were used . I did not follow the issue further, was it that at some point the gold vs. silver inscription designated the level of the bearer (kind of). Is silver inscription altogether abandoned today? - Civil Flag and alternative State Flag (CS-/--- 3:5) - Simple undefaced blue-white-blue triband. 3. Alternative National Flag and Civil Ensign. 7:10 (this is an odd ratio - I am ready to account it as an error/typo). Adopted 1822 (not 1821! ), minor modifications 1841, abandoned 1865. Reintroduced with minor modifications in 1912, slightly modified in 1916, last legislation or confirmation 1972. See: El Salvador - Historical Flags (1865-1912). Article 5.- The national flag is composed of two horizontal blue stripes with a white stripe between them, [all] in a cloth rectangle. The three stripes will have the same dimensions. Article 6 - There will be three classes of official national flags: the great one [la magna], the one for use on public buildings and offices, and the one for parades. Article 7 - The great flag [la bandera magna] will be three meters and 35 centimeters in length by one meter and 89 centimeters in width, on which will be paced the coat of arms with all its accoutrements. Notwithstanding, when local conditions and circumstances merit it, the flag may be used in larger dimensions. Article 8 - The great flag will be used on occasions in which the three powers of the state take part in sessions, meetings, or observances, or to celebrate national days. Article 9 - The flag for use on buildings and in public offices will be one meter long by 70 centimeters wide, but when the circumstances of the building allows these measurements may be increased. On the center stripe it will carry the legend DIOS UNION LIBERTAD. Article 11 - The parade flag should measure one meter 45 centimeters long by 90 centimeters wide and will be mounted on a cylindrical staff two meters 50 centimeters long by four centimeters in diameter. The staff will terminate in a golden-colored lance in the form of a rhombus, edged on the sides and on the point, and of maximum thickness along the center line that joins the angles. At the join of the lance with the staff two ribbons of two meters in length will be affixed, one white and the other blue, each six centimeters wide. On the white ribbon will be inscribed the name of the establishment and on the blue its location in gold letters. The white fringe of the parade flag will carry the inscription in gold letters DIOS UNION LIBERTAD. Article 12.- Official delegations named by the government to represent the country abroad, which have to use a flag for the purposes of their mission, will use the flag for public offices and buildings with the coat of arms and all its accoutrements. Article 13 - The national flag in reduced dimensions with the shield or with the legend or simply the colors may be used on all state property where appropriate. The same applies to private properties for the purpose of civic celebrations. Article 14. - National ships or those of Salvadoran registration will use the national flag in conformance with treaties, conventions, or special dispensations. 1. All the government buildings, inside government offices, the presidential house (Casa Presidencial), the flag in the president's office or other officials, National Palace, border crossings, airport, ports, embassies, consulates, municipalities, boats, airplanes, etc. ; also the five huge (18 feet x 30) feet flags that are located one at flag plaza (Plaza de la bandera) and the other 4 at the four cardinal points of entrance into the capital city, all use the flag with the national emblem usually in the 3x5 ratio. 2. All army, air force, navy, military schools, military hospitals, navy posts at the ports, etc., fly outside the flag with the inscription (DIOS UNION LIBERTAD) in a yellow gold color and such flags have a 1x3 ratio. The battalions will have the flag with the emblem with Dios Union Libertad in gold on the upper blue stripe and the name of the battalion class and number in gold on the lower blue stripe for artillery and infantry and in silver for cavalry. Merchant boats have the letters in silver or blue. 3. The plain flag without the emblem can be seen sometimes at schools, houses,, etc. I see El Salvador flags on a regular basis. The main highway through the part of northern Virginia where I live is plentifully supplied with Salvadorean restaurants serving the immigrant community, almost all of which have Salvadoran flags displayed, either flying outside or hanging on the wall inside. And, as I said at first, they all have the emblem. So, at least de facto, this as well as the plain one would seem to be the civil flag - and there's nothing in the law to preclude that, as far as I can tell. However, one should consider that they use the flag with the emblem so nobody will misidentify then as Argentine or other B-W-B flags. That would not be easy to distinguish from 189x335 (ca. 3:5.3). Though, I could imagine that manufacturers "simplify" it to 3:5. I guess that today, when flags with emblem and inscriptions are more easily acquired, the plain flag would be less and less used. Especialy, since it seems there is no legal hindrance in using the other two. They did ask for flags in the following dimensions 90 cm x 150 cm when I supplied quite a few satin flags with embroidered coat of arms to some of the government offices, entities and ministries for official acts and offices of dignitaries. Concering the ratio of 1:3. When I offered to sell them the flags they told me that they are manufactured by the army to be flown on their buildings, hospital, schools etc. and that is the ratio, they all are manufactured. I wonder if it this has to do with the letters, because they expand almost the whole extension of the white stripe. The letter are quite wide and tall. For El Salvador: PMS 300 blue, 102 yellow, 032 red, 348 green and black. The vertical flag is simply the horizontal version turned 90 degrees clockwise. I located a flag variant at a photo at story.news.yahoo.com. 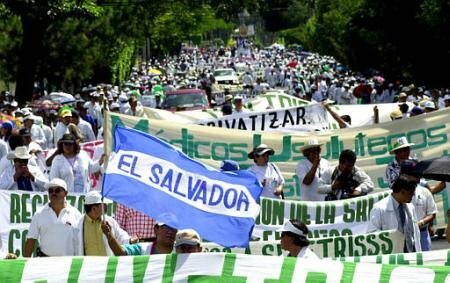 The item is described there as " Salvadoran doctors march through the principal streets of San Salvador, El Salvador, Wednesday, Oct. 16, 2002. Thousands of doctors marched through the city to protest the privatization of health care. ( AP Photo/Victor Ruiz Caballero)"
This flag was created by a company that makes flags, so they could be used for soccer games in order not to get confused with flags of Honduras. 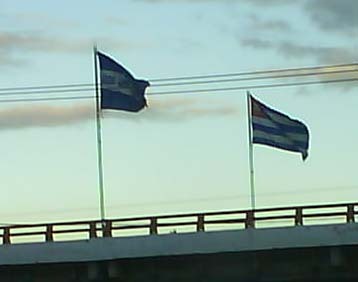 While traveling in San Salvador this year, the new mayor of the city has placed flags of the city of San Salvador all over the city next to the flag of El Salvador, I am enclosing a picture of the flags flying on an overpass. Interesting also is that the flag with the inscription on it is also flown all over the city instead of the flag with the coat of arms (which is also seen). I am enclosing a picture of the flag, flying at the Plaza de la Bandera. Presidential sash from the inauguration of president Araujo in 1911 with the old flag of El Salvador.